To collect and process information on the customer activity of a person, group of people or business cooperating with you, you can create an account that will represent them in your Oro application. keep reading the step-by-step guidance below. Click Create Account in the top right corner. In order to add a contact, click the +Add in the Contacts section. If you need to record and process any other details of accounts, custom fields can be created. Their values will be displayed in the Additional section. Please, refer to your administrator for assistance. Once all the necessary information has been defined, Click Save. The Page Header has the date of account creation and its latest update, as well as its lifetime sales value. The General section is for general details of the account, such as its name, tags, description and all the contacts assigned to the account. The Activity section includes any activities related to the account, such as attachments, calls, calendar events, notes, emails or tasks (if available). The Additional Information section provides details of any custom fields defined for the account. 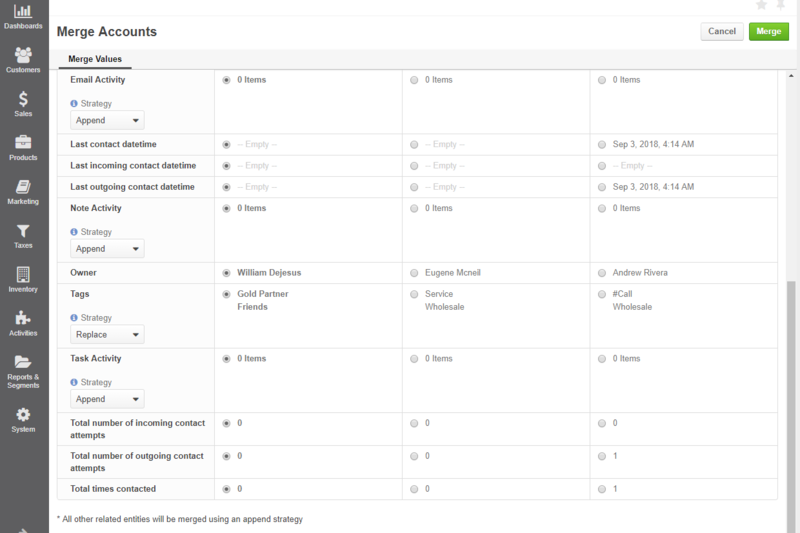 The Website Activity section lists customer activities displayed in the Summary and Events subsections. The Sections with channel names. Each section contains details of all the customers that are assigned to this account and belong to the specified channel (e.g. Sales, Magento, OroCommerce). Records of other entities assigned to this channel with regard to a specific customer are represented as subsections. The Magento Orders subsection lists all the orders related to the account. 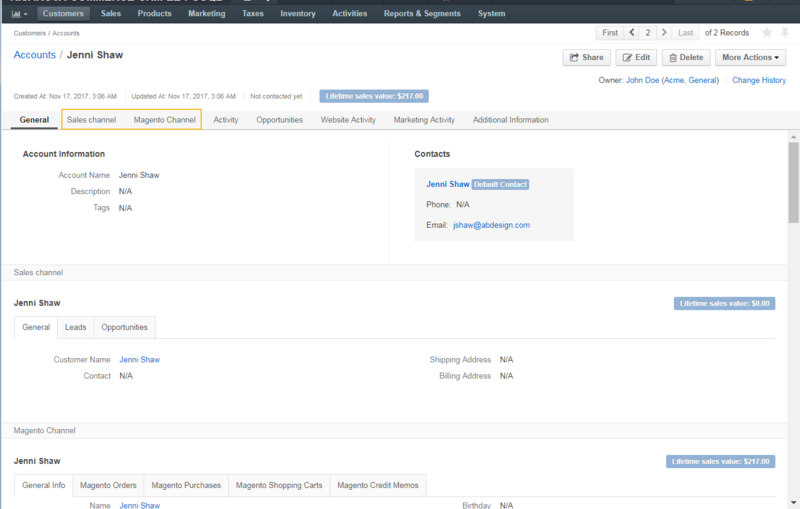 The Magento Purchases subsection gives a quick overview of the products that the customer recently purchased. 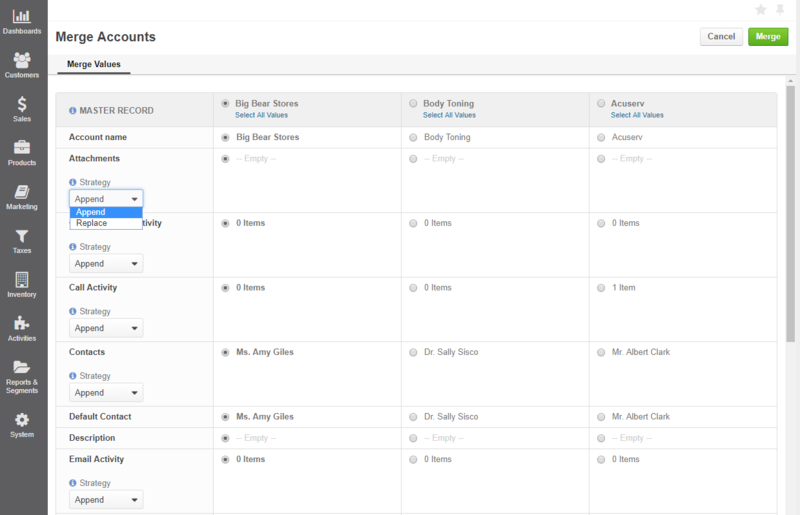 Products disappear from the list if an order is cancelled or deleted on the Magento side. 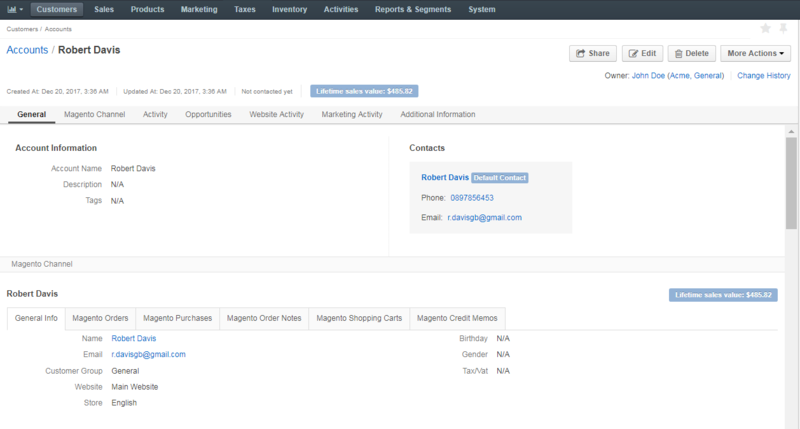 The Magento Shopping Carts subsection shows the details of the shopping carts related to the account. The Magento Credit Memos subsection is for credit memo and order details, such as the store from which the order has been placed, order number, the amount refunded, etc. 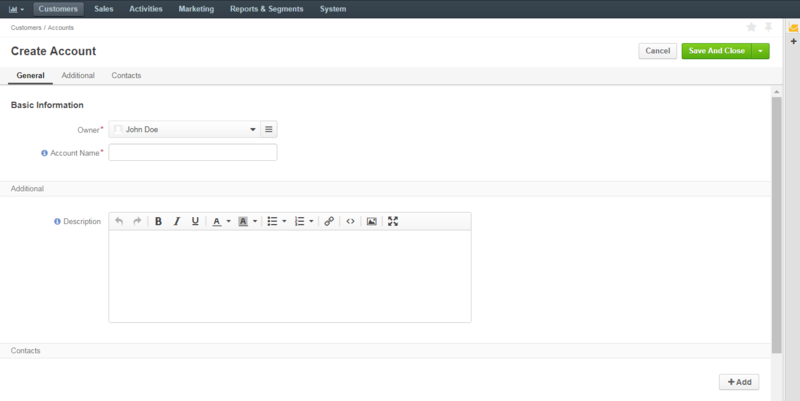 The Magento Order Notes subsection show the comments added to an order on the Magento side as notes in Oro. You can export the account details in the .csv format following the Exporting Bulk Items guide. You can import the bulk details of updated or processed account information in the .csv format following the steps described in the Importing Accounts guide. Once the accounts have been added to the system you can merge them, to get a full view of customer activities, regardless of the channels. This can be useful if, for example, it has appeared that several accounts have been created for the different representatives of the same client, or that your business-to-business partner is co-operating with you from a new channel (e.g. started buying from your Magento store). Click the ellipsis menu at the right end of the table header row, and then click the Merge icon. (See Merge Records). This a report, with which you can see the total amount of money received from all the customers assigned to the account. The total lifetime sales value registered in your Oro application. The total number of opportunities of a kind, regardless of their account. New custom reports can be added that can use details of the accounts, as well as of any records related to the accounts. 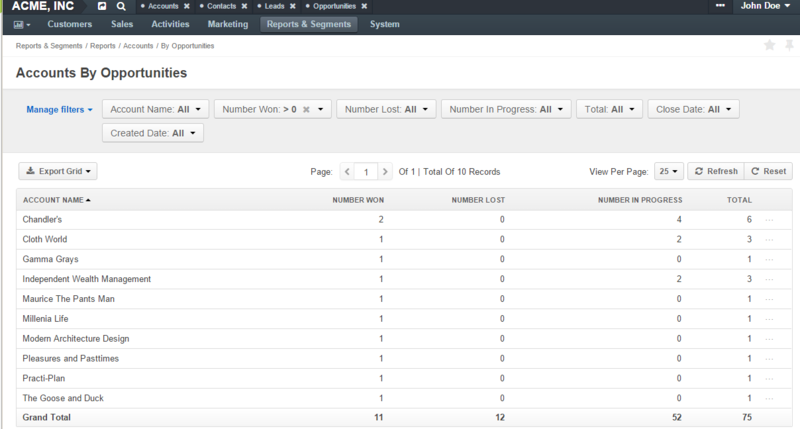 For more details on the ways to create and customize the reports, refer to the Reports topic.